My quest for colour continues. 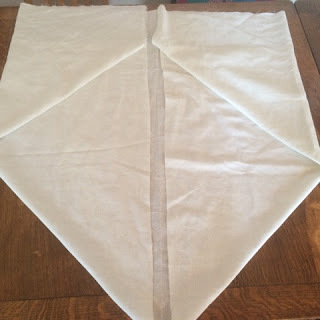 I know I said I needed to get more comfortable with the natural offwhite of my fabric but I haven't been as inspired by the lack of colour as I have been with the addition of it. This quest has me looking at the natural world in a different way. For instance, I was driving into town today and passed a robins egg, broken open, on the road. Oh the color! That ever desirable robins egg blue. It seems so elusive in the natural world. Any naturally blue object in the environment seems to have an almost mystic or magical quality about it, like a blue morpho butterfly. But then I realized that I see robins all the time. They are the one creature that seems most abundant in my natural environment. I say this because I am grateful to live in a relatively rural and undeveloped place and my expectation is to encounter "wild life" from time to time. We do see deer, eagles, even bears, but mostly birds and always robins. My epiphany was, that with so many robins, there must be so many robin eggs! A current abundance. 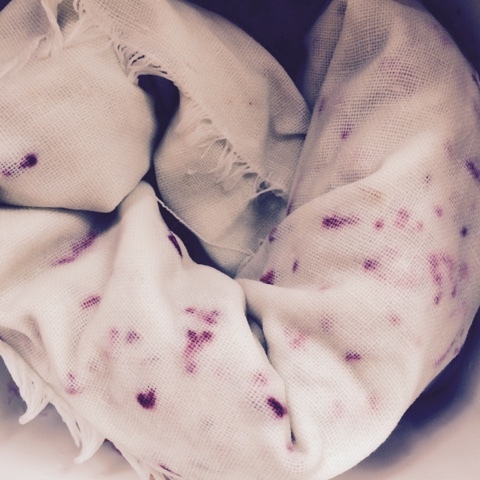 I've been experimenting with natural dyes during the past weeks of this project and I can honestly say that it is a challenge. I am thrilled with how well turmeric works as a dye. 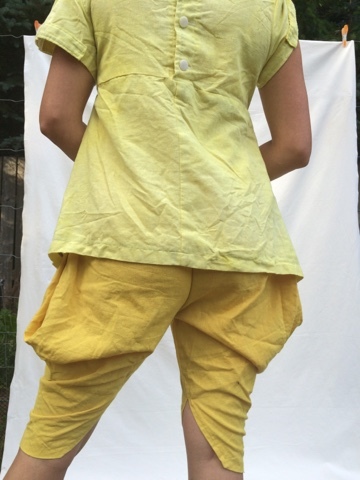 For these pants, I used approximately two tablespoons of turmeric spice in about 5 litres of water. The color is deeper than the top which likely used less spice and I'm sure the color could be even richer if more spice was added. Part of my enthusiasm for turmeric as a natural dye is because other natural dyes I have tried truly pale in comparison. Purple cabbage has been mildly successful and berry dyes as well as flower dyes, have created brilliantly coloured fabrics, but the colors wash out to create a dull grey that is subtle and lack luster. "Due to the porous nature of the fiber, hemp is more water absorbent, and will dye and retain its color better than any fabric including cotton. 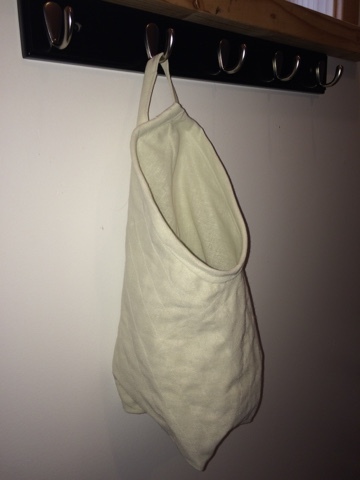 This porous nature allows hemp to "breathe," so that it is cool in warm weather. Furthermore, air which is trapped in the fibers is warmed by the body, making hemp garments naturally warm in cooler weather." 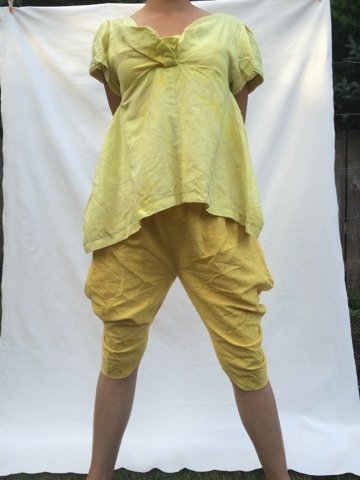 The design or thought for these pants came soon after I created the Turmeric Top in week 2. Because of the way the pockets were created in the top, I wanted to try repeating this "corner" pocket idea in a pair of pants. 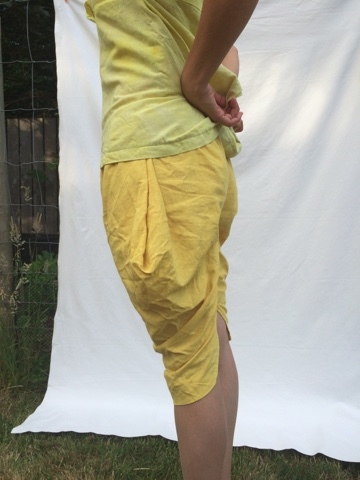 With one yard of fabric, pants are difficult to do and get any length, therefore the end result is a Capri. The pattern was created with only a few cuts and only three small pieces were removed from the largest piece. One piece formed a small pocket and the other two were sewn inside the pants to create a false zipper front. The actual waistband has wide elastic running through it. The elastic waist and relaxed fit create pants that have a special ease about them. This is added to by the wonderful quality of hemp fabric which gets softer and more relaxed with wear and washing.